Zoo animals like lions and tigers may be exciting, but we have a native animal that’s just as big and exciting: the bison. A study of bison can liven up a study on Native Americans, pioneers, the West, or the Great Plains. They’re also a fun animal study subject. 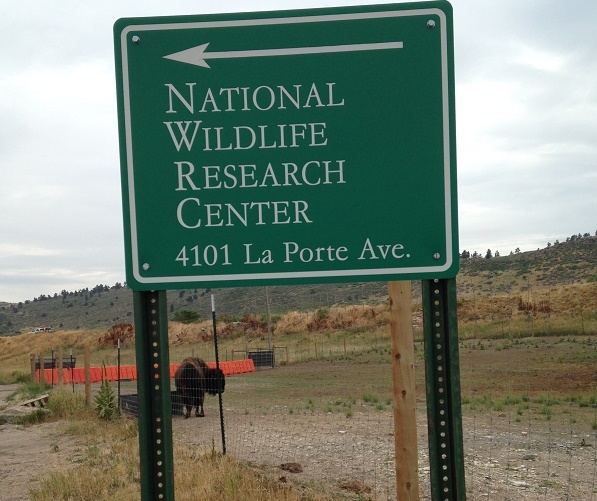 FreshPlans visited some bison at the National Wildlife Research Center in Ft. Collins, Colorado. Can you see the bison in the picture below? He doesn’t look very big, right? Up close, these are very big animals. They came up pretty close to get a good look at us, so we got a good look at them, too. We saw bison standing around, eating grass, standing around, rolling in the dirt, and standing around. This is pretty much what we do, our guide explained. “They can run, and if they do, you want to get out of the way,” he told us. But they don’t go scampering around for fun. 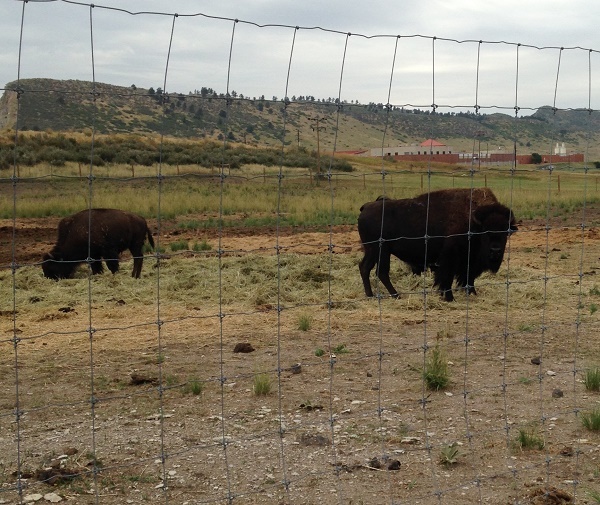 These bison are part of a joint USDA and Colorado State University project to bring healthy bison back to Colorado. A disease called brucellosis has become a problem in the herds of buffalo in Yellowstone Park. The project is using new technology to breed healthy bison who are descendants of the Yellowstone Park herds, without the dangerous disease. Morphology: the physical characteristics of animals, including body parts and adaptations. Life cycles: how animals are born, live, and reproduce. Habitats: the places where animals live. Relationships with humans: how humans affect the animals and how they affect us. Even though we got a good look at the bison, we couldn’t touch them. We were curious about their unusual shape. 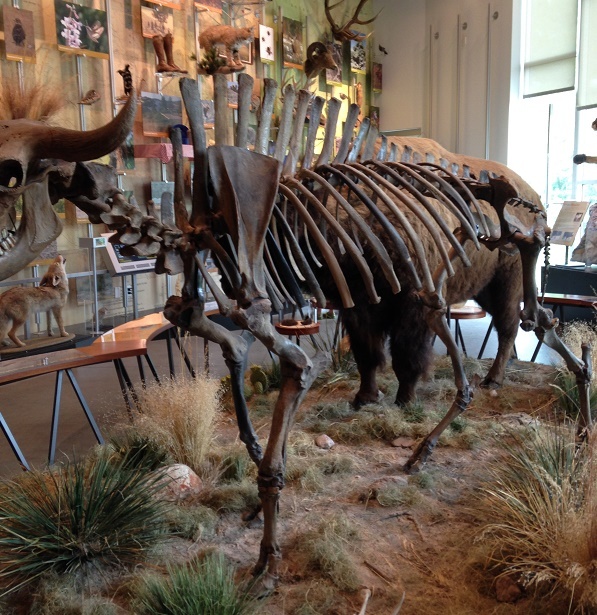 So we went to the Discovery Museum in Ft. Collins to look at the skeleton of a bison. We saw that the big humps on their backs had bones inside. It reminded us of a stegoasaurus. 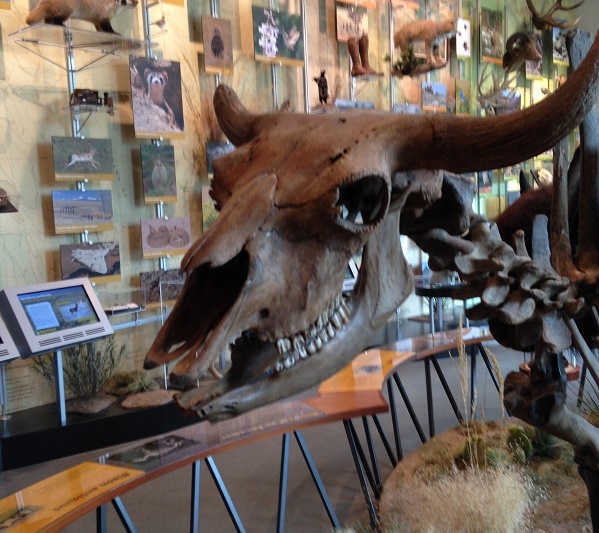 We got a good look at the skull of the bison, which seemed to be wearing a happy grin. Check out an interactive lesson on the bison’s digestive system to get an idea what’s inside a living bison. We learned that bison are mammals and ruminants, like cows. They have live babies, which grow up and have babies of their own, just as people do. The museum has a taxidermy bison, which looked a lot like the live bison we saw — although it was a lot cleaner and neater. We got to feel bison fun, and we were surprised to find that it was very soft. This bison is shown in a place made to look like its natural habitat: the prairie. The bison we visited at the USDA Wildlife Research Center live on the prairie, but they don’t get to roam like the buffalo in the song. While some people eat bison meat today, we learned that most “buffalo meat” you can buy in a restaurant or a grocery comes from animals which have both bison and domestic cow heritage. We found bison wool yarn in Ft. Collins, but once again it included both bison wool and wool from sheep. Bison’s relationship with people today is less about human beings using bison for practical purposes and more about humans trying to care for the bison and make sure our grandchildren can still see this majestic animal on our prairies when they grow up. Native Americans living on the plains and prairies, however, relied heavily on bison. Let younger students try out this interactive lesson on the relationship between Native Americans and bison. Older students will enjoy this more complex interactive web page from the Smithsonian. Check out the Smithsonian’s Interactive Bison Exhibit for a little mouse practice and reading. Set it up as a station at your classroom computer and let students whet their appetite for learning about bison with a lot of intriguing facts. Mr. Nussbaum has some fun activities about bison, both online and printable. Texas Parks and Wildlife have a lesson on what bison eat. This page includes a number of different activities bringing up a lot of interesting points, and introducing the word “forbs,” which was a new one for us. There’s an interesting activity asking students to analyze a photograph, which we think could be a good part of critical reading and media literacy lessons. Feel free to use the photos on this page for your analysis! The U.S. Mint has a lesson that helps students to recognize bison as natural resources. Both this lesson and the previous link include plant study. 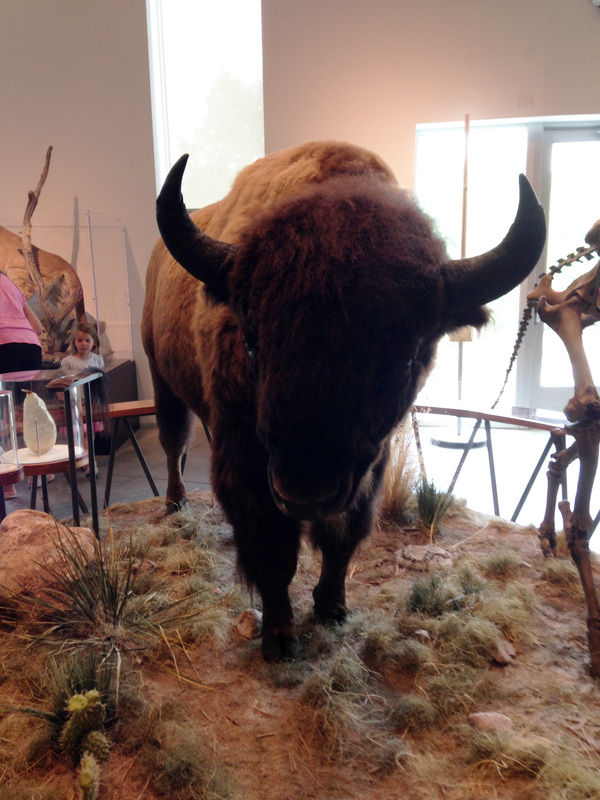 Woolaroc Museum has a bison lesson plan pdf with reproducibles including information about bison and Plains Indians, as well as a retelling of a traditional folk tale. The Smithsonian American Art Museum has a lesson using George Catlin’s paintings and writings to explore the idea of regions. The National Wildlife Federation has a science process lesson that gives students hands-on insight into why it’s so hard to get firm numbers for animal populations. They also have a great bison lesson plan with lots of background information which could be used alongside the first lesson. Check out the LiveScience Bison News page. This could be part of your classroom morning news roundup, a great reading resource for your bison unit, or part of a student research project.